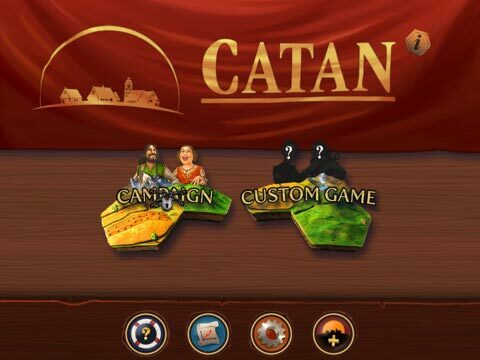 This game page is for Catan on iOS and Android devices. The complete Seafarers expansion includes more than 10 additional scenarios with an extensive campaign and is available to purchase from the Catan In-App Store. Become Harbormaster, discover new islands and extra game elements like ships, gold fields, treasures and pirates. Ahoy! 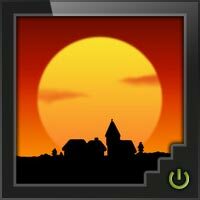 Find out if you really are a secret settler, confront your rivals and become Lord of Catan! Additional features available via in-app purchases. Catan was THE game that got me into the gaming hobby. I was introduced to it over ten years ago at a game store I frequented. The guy who introduced me to it was an uber-competitive **** cavity who, if he began to lose, would find ways to cheat or quit. But….other than him, I was introduced to Catan and began playing it with others. I even participated in the Catan World Qualifiers in Columbus, OH, almost a decade ago and made it to the final round. So…I was in the top four! Yee Haw! But in the real world, the non-competitive world, unfortunately, I didn’t always have people to play the game with. So the box sat. Lonely. Forlorn. Calling to me to come visit it again, to bring it out and play it. But I couldn’t. So Catan sat idle for a long, long time. It still sits on the shelf more times than not. But I can now get my fix no matter where I am or how many people are around. Catan-iOS came along and I quickly snatched it up. And I play it on a regular basis. It’s Catan! It’s the classic resource management game on my iPad. But….it’s not without its flaws. Even though I have played the Catan competitively and know the game fairly well, I had trouble getting used to the iOS game. The Graphical User Interface (GUI) isn’t very intuitive. Even after playing this for months, I still can’t figure out where my victory points are being displayed. I have had the game freak out on me a few times, letting me roll the dice then skipping immediately to the next player whose dice were rolled and the switch was immediately made to the next player….ad infinitum. Those instances are few and far between, but they do happen. I have yet to really play it online. I don’t know why; I just don’t have a desire to do that. I tried once, it was really slow, and I haven’t tried since. iOS Catan is, despite those flaws, the best board game simulation experiences I have had. It allows you to get your fix no matter where you are. 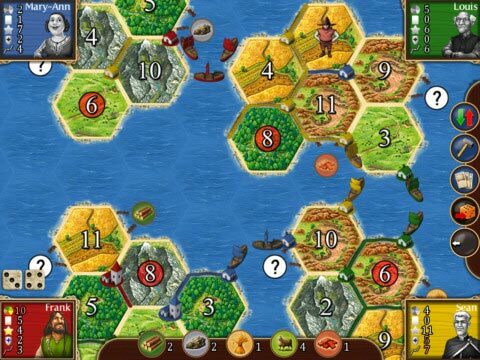 If you love Catan and an iDevice or Android device, this is a must have game. Even with the flaws, you can’t go wrong. NOTE: I have given Components 3 stars, but the components are sprites. Little electronic pixels. There ARE no components. I’m grading this on the the GUI. And the GUI could use some work to be more intuitive. Settlers of Catan is my all time favorite game. The digital version is awesome because it lets you play anywhere, anytime. It has provided me hours of entertainment waiting in lines and at restaurants. It is also a great way to get current norms hooked on gaming. As I have said before Catan is a great gateway game. However, with some people you pull out a board and pieces and the get intimidated, but just about everyone is familiar and at ease with phone apps. Another reason to get this app is for the campaign option. Playing a straight custom game with bots, even if you can choose different difficulty levels, can get boring because unless you are just using this game as training wheels inevitably you are going to beat them. The campaigns spice up traditional Catan. One of the biggest drawbacks to the digital version is it is very easy to figure out if someone has a resource with the trading function, also they don’t hide the last players resources when the bots are going so be careful when passing the device. The real value here is you can play Catan solo. But, the flip side there is you realize Catan suffers a bit w/o the social factor of playing with people. And, as others said, the UI is oddly out of date. It looks like a Sega Genesis adaptation of the game. Having tried to play the game at Catan’s website, I know its an IOS version of the same, but that’s not a compliment. And, its not just the appearance, controlling the action can be frustrating. Sometimes doing what you don’t want, sometimes unable to do what you intend. I’ve got it on my phone, so maybe a 7″ or bigger screen helps. If you like the board game, and I do, its fun enough. When I’ve some time, I play it. But there are better games for a lower price. I’m a fan of digital board games as it allows new players to get a grasp of the rules quickly. I’ve played this on android, and it’s a fantastic adaptation of the board game. The AI is a bit predictable, but there are enough characters to play against to keep it fresh. Whether you’re stuck on public transportation or waiting a while for an appointment this game will help you pass the time. I would pick this up on android since you can play it on your phone and tablet for one price. Games are about 15-20 minutes, 1-4 players. 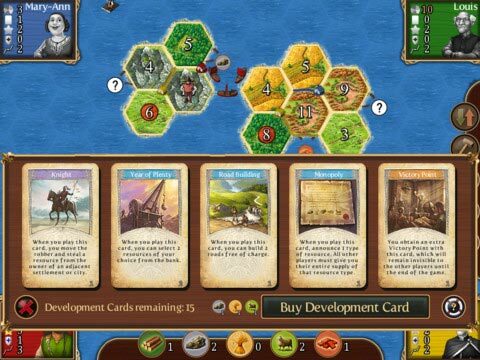 This is the digital adaptation of the popular game The Settlers of Catan. Its not necessary for you to have played the original board game before. The Digital version offers a very good tutorial. The game is set up with a game board of 19 hexagonal terrain tiles. The terrain tiles is the key of the game, they contain different types of products that will be produced during the game, depending on the result of the dice roll. Hills produce brick, forests produce lumber, mountains produce ore, fields produce grain, and pastures produce wool. In the beginning of the game all players each place two small houses (settlements) and two roads on the board game. The settlements will be placed on spaces where three terrain hexes meet. The roads will be placed next to the houses. The dice roll is an “8”. Each player who owns a settlement adjacent to a terrain hex marked with the number “8” now receives a resource produced by this hex. To build a road you will need to “cash in” 1 brick and 1 lumber. That means that you will need to have a settlement or a city adjacent to a hex that produce these products. But you can also trade in other resources for your benefit, either with the bank or a harbor but also with the others players. The objective is to win 10 victory points before anybody else does. You can do this by building settlements and city’s, they give you each 1 VP for settlements and 2 VP for city’s, you´ll receive 2 VP if you have the longest road, build a minimum of 5 roads that are connected. If you have the largest army which can be collected by buying development cards you will receive additional 2 VP. When you have collected 10 VP you win the game. The digital version is amazing, you can play offline against bots or online against real players. If you buy the expansions you can also play a campaign and also different scenarios. Obviously its much more fun playing the original with friends but this is a good substitute, especially when you play against other players from around the world. I love how this game allows you to play on your own (with 2 AI), or local/online with other people, (e.g. I would play local with my husband plus 1 AI). This digital game really introduced the game well to us and we love it so much that we decided to buy the board game, that was till we realised it requires a third person which we don’t normally have. I also like how this game would allow you to play while you’re traveling, such as in flights and so on. It’s a pity it only lasts like around 30 minutes, but it’s good for those ‘let’s just play for a bit’ moment rather than really having a proper sit down and play for hours sort of thing. It’s well worth the download and would recommend it to anyone who’d like to have a multiplayer game with someone else through the mobile and all. I should start by emphasizing how much I love Catan, and how much I love iPad/iPhone adaptations of board games. Unfortunately, this is digital version falls short of the capabilities of the technology and looks like someone designed it in 1994 and it came delivered on 8 Floppy disks. I wish more was done to improve the UI, as the controls feel a little clunky at times. Most of all, Improvements should made to the graphics. The art and animations are cheesy and annoying. I’m not saying turn it into a video game. Instead I wish it looked cleaner, more like what Ticket to Ride accomplished in their iOS version. If you’re a Catan addict, this game is worth the money to get a little practice in your down time. If you’re looking for the best board game adaptation on iOS, get Smallworld or Ticket to Ride instead. I think the electronic version is well made and a good adaptation of the board game but I really miss the social factor. The graphical interface is easy to use and he whole game feels like the board game mechanically. But I found that the game wasn’t very fun to play without friends around the table. I think Settlers of Catan need “real” opponents and playing it solo removes a vital dimension of the board game. Love this version, I can take my Catan where ever I want, and not have to set it up. Not a big fan of having to unlock the scenarios to play the expansions as a custom game, but it’s not that bad since I’ve already played them. AI’s get a little whiney but I’ve tuned that out. Trading with AI’s get’s to be a pain near the end of the game. They never want to trade with you, so make sure your settlement and city placement can get you to the end game without relying on trades. Overall I love having it with me, and it’s great when you can’t get the gang together for a tabletop session. Not much variety unless you purchase the expansion. The gameplay is the same as the board game, but you have the option to play by yourself against computer opponents. Again you start out with two settlements and two roads, and you place them based on who goes first. The last settlement you place allows you to collect adjacent resources. Each player takes turn rolling two dice for resources, trading for resources, buying cards, and building roads, settlements or cities. Points are awarded through number of settlements and cities along with bonuses for most roads and armies. The first person to reach the number of points for the scenario will win the game. This a really good game. The AI is pretty good sometimes if you’re playing by yourself. The graphics are top notch. The interface is fairly easy to figure out. This has every thing you know and love about Catan along with solitaire play if you need a Catan fix with no one around. My only beef about the game was some early bugs that made the game lock up at weird times, but they appear to have those fixed now. I don’t like it that you have to purchase expansions in game. I would prefer deals where I can buy everything at once at a good price. If you looking for a good Catan version on the go or just want to play by yourself, download it. Another good reason to justify your iPad purchase! It’s great. Add a Review for "Catan"